Roaming Stamper: Is it too soon to think Christmas?? Well, I kind of think so, but I've been working on a few Christmas realated projects and wanted to share this one with you. 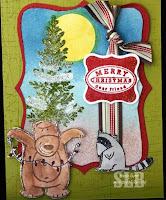 I had a lot of fun using the animals from Under the Stars and mixing it with lights from Mr. Twigster, a tree from Lovely as a T ree, and then the great sentiment from Cute & Curly. Add in the Sanded background and I used 5 stamp sets for this one card, that has to be a record for me! I think what I love most is that the little racoon seems so happy to see that it's the bear fighting the lights and not him. Kind of reminds me of my house! I spent most of today finishing some projects for my stamp club ladies who will be here on Saturday and working on a couple of swaps. Just because it's Christmas today, never fear I'll be back to fall stuff probably tomorrow. Or maybe birthday, or thank your, or......??? I guess you'll just have to come back and see!! Oh no, it's never too early! I have already started listening to the Christmas music! Love, love, love your card!